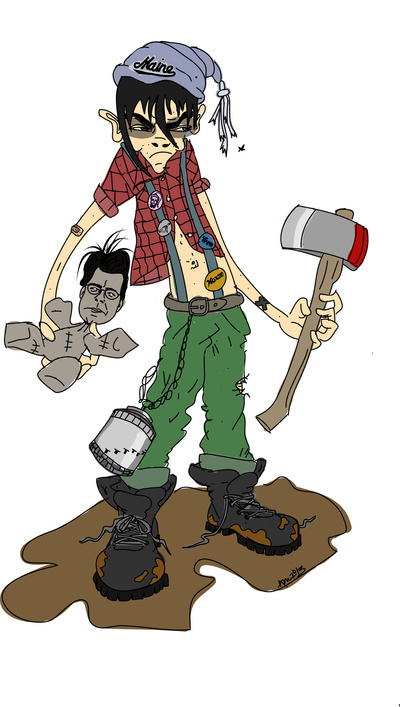 Wielding an ax in one hand and a Stephen King doll in the other, Cordwood Pete (a.k.a. Paul Bunyan's little brother) looks like one mean, lean, wood-cutting machine in A. Correia's illustration. Entitled "Cordwood Pete," the piece can be ordered on a t-shirt, pillow and more at Correia Creative's online shop. However, if you're looking to own an original, consider checking out the Black Bear Skatepark Association's online Unsanctioned Art Auction. There you'll find an acrylic version of "Pete" (painted on a skateboard deck) as well as decks by many other local artists. Final bidding begins Wednesday, May 15th at 6pm at the Keith Anderson Community Center in Orono. Proceeds go toward the construction of a UMaine Campus Skate Park.